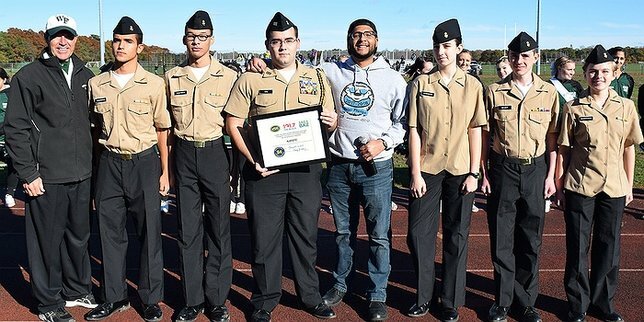 The NJROTC was selected for their work with “Boots on the Ground NY,” an organization that provides support to service members and veterans in numerous ways. The William High School Naval Junior Reserve Officer Training Corps. Mastic Beach, NY - November 14, 2018 - The William Floyd High School Naval Junior Reserve Officer Training Corps (NJROTC), under the leadership of Commander Jay Tweed (USN/Ret.) and Senior Chief Dwight Becherer (USN/Ret. ), recently received the Thomas Cutinella Foundation Service Award presented by LI Beach Radio 101.7 FM and the “Tour for 54” for exhibiting the characteristics of kindness, modesty, selflessness and concern for their community and others. This award is given in honor of Thomas Cutinella, a 16-year old Shoreham-Wading River High School student-athlete who suffered a fatal injury from taking a hit to the head in a football game in 2014. Since 2016, Beach Radio and the “Tour for 54” have been visiting high school football games each week to honor an individual or organization that best models Thomas Cutinella and his legacy. The NJROTC was selected for their work with “Boots on the Ground NY,” an organization that provides support to service members and veterans in numerous ways including sending care packages, food and so much more. Cadet Commanding Officer Humberto Diaz accepted the award on behalf of the entire NJROTC along with fellow cadets who had the honor of presenting the colors before last week’s football playoff game. The NJROTC also participates in various food drives and toy fundraisers, and has been instrumental in raising funds for cancer research in local Relay for Life events. They also march in various parades such as those honoring Veterans Day, Memorial Day and the local Christmas parade. The cadets will have the honor of marching in the Veterans Day parade on Sunday, November 11, marking the 100th anniversary of the armistice which ended World War I on November 11, 1918. The parade will begin at 11 am and can be seen on Pix 11 and livestreamed on www.military.com. The mission of the William Floyd NJROTC is to instill in student cadets the core values of honor, courage, and commitment, along with the values of citizenship and service to our community and country, upon which they can individually build a foundation of trust and leadership that will be recognized as the hallmark of the unit. The vision of the NJROTC instructors is to build cadet’s individual self-confidence and leadership abilities to enable them to succeed and excel, individually and collectively. The William Floyd High School Interact Club, the student offshoot of the Rotary Club of Shirley and the Mastics, received the Thomas Cutinella Foundation Service Award last year. John Hope Franklin Distinguished Lecture to Be Delivered By William Jelani Cobb, Ph.D.
Subject: LongIsland.com - Your Name sent you Article details of "William Floyd NJROTC Receives Thomas Cutinella Foundation Service Award"